After the defeat at Dunfermline it was a stronger team that was able to take the field for this game at Somerset Park. The Warriors brought back Mark Gilhaney, Colin McMenamin and Jason Scotland whilst Jamie Barclay who had only returned to training the previous week replaced the suspended Colin McCabe. The balance of the team was better and it showed in the play where they matched the home side for large periods of the game. In the early stages of the game though Ayr were on top and Craig Moore was denied by a Barclay save at close range in the 3rd minute. At the other end McMenamin just failed to get on the end of a deflected Gilhaney pass. Barclay did well to tip a Paddy Boyle free-kick over the bar in the 21st minute and he was denied once again in the 36th minute. Three minutes later Stephen Stirling saw into the side netting after creating an opening for himself. The second half started promisingly and the first chance of the half fell to Stenhousemuir when a Jason Scotland pass picked out Gilhaney but his effort was saved by Greg Fleming’s legs for a corner. 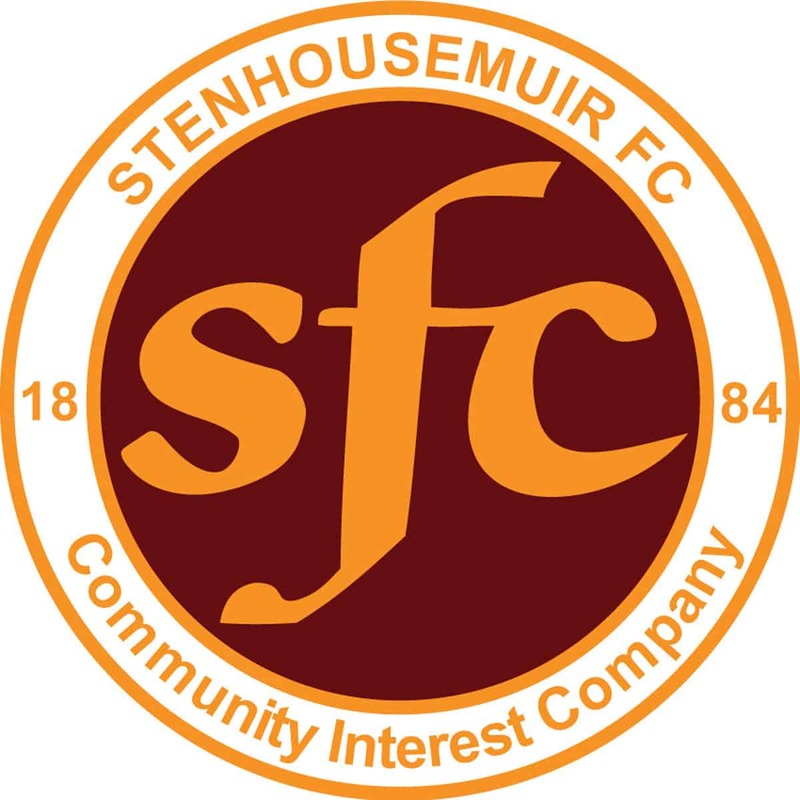 As the game progressed Stenhousemuir looked the more likely team to open the scoring with McMenamin just failing to get on the end of an Ross Meechan cross and Alan Cook seeing a strike blocked. but the introduction of Alan Forrest gave a boost to the home team and he tested Barclay within seconds of coming onto the pitch. Ayr took the lead in the 65th minute when a free kick by Ross McCrorie spat up and Barclay failed to deal with it properly and Moore reacted first to put the ball in the net. To their credit the Warriors kept plugging away and Jason Scotland’s freekick was superbly tipped round the post by Fleming. From the resultant corner though Jamie McCormack headed the equaliser. Moore then hit the post from 5 yards out in the 70th minute but a minute later the game turned when Alan Cook was sent off for his second caution and there could be no complaints about the second booking for a wild tackle on Devlin. Ayr took full advantage though they had a stroke of luck in the 76th minute when Stuart Malcolm turned a Nicky Devlin cross into his own net. Any chances of a comeback ended when Ryan Stevenson scored with a 35 yard effort after no one closed him down. He almost repeated the effort with a similar strike from distance just before the end. In the 89th minute a Jon Robertson strike was beaten out but that was not the end of the scoring as in their best play of the game Alan Trouten finished off a flowing move in stoppage time to put Ayr further ahead. The final whistle blew after a flurry of bookings as frustration took its toll. This was a harsh score for the Warriors who had put so much into the game but a moment of indiscipline turned the game and the ability of Ayr to take full advantage goes to their credit. Ayr United – Fleming, Devlin [b5], Boyle, Murphy, Graham, Stevenson, McCrorie [Gilmour 65], Docherty [Preston 76], Moore, Trouten and Adams [b42][Forrest 57]. Subs not used – Donald, McLauchlan, Wardrope and Newman. Stenhousemuir – Barclay, McCormack [b90], Summers [b21], Malcolm, Murray, Meechan [b59], Gilhaney [b90], Stirling [Small 81], McMenamin, Scotland [J.Robertson 74] and Cook [b53][so 71]. Subs not used – McCroary. Marenghi, Mazana and S.Robertson. Referee – Alan Newlands Assistants –John McCrossan and Alan McFadyen.